Break-even analysis is not a panacea. It doesn't tell you if your costs are out of line. It tells you only what sales volume you need to cover fixed costs. It is, however, an excellent starting point for finding out where you are and, more importantly, where you can go. It's a good first step to planning. This guide presented as a conversation between a business counselor and the owner-manager of a retail store, discusses an effective method of calculating the break-even point for a retail operation, it provides a financial planning take-off point. Break-even analysis is not a panacea. It doesn't tell you if your costs are out of line. It tells you only what sales volume you need to cover fixed costs. It is, however, an excellent starting point for finding out where you are and, more importantly, where you can go. It's a good first step to planning. 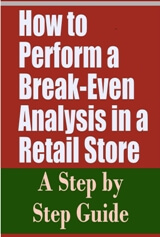 This Guide presented as a conversation between a business counselor (C) and the owner-manager of a retail store (M), discusses a simplified method of calculating the break-even point for a retail operation. While this method is not appropriate for manufacturers, it does provides a financial planning take-off point. M: I'm ready to expand. I've just had a great forth quarter. I've got a chance to move to a larger store in a good location. I really think I'm on my way. Still, though, I don't want to take any unnecessary chances and lose what I've built up these first three years. What do you think I should do? C: Let me answer your question with a question: What's your break-evenpointnow and what will it be if you assume the added expansion cost? M: I'm not exactly sure, but after that last quarter, I've got money in the bank and I'm paying all my bills on time. C: I'm glad to hear you're in good shape, but you can't make an intelligent expansion decision based on your bank balance at a given moment. C: Take your balance now, for example. It's a lot better than it was atthe end of the first quarter, isn't it? M: Sure, but the first quarter's usually slow. It's a fact of retail life. C: And the fourth quarter is usually good, right? M: Yes, that a fact, too. But mine was outstanding - it was the best I've ever had. C: I'm sure it was, but it can distort the picture. If you’re relying on your bank balance for a feel for your break-even point, you may just be guessing. Many things influence your bank balance that may not necessarily have a direct bearing on the break-even point for your store. Seasonal fluctuation is just one of them. M: Okay, I get the point. My bank balance is meaningless. I shouldn't expand. C: We don't know that yet. After we find out what sales volume you'll needto break even, then you'll tell me if you ought to expand or not. M: Some counselor. First you tell me I don't know what I'm doing and then you expect me to advise me on expansion. C: You're wrong on the first half of that; I know you know retailing. But, yes, you'll decide on the basis of your business knowledge and judgment whether or not expansion now makes sense. M: I must do something right. I'm still in business. C: Exactly. You've made it through some of the toughest business years, the first ones. And you're showing a fair profit. I think you've got a real flair for merchandising. M: Please, you'll make me blush. What about this break-even thing? you must work with only two factors, fixed expenses (like insurance or rent) and variable costs (like cost of goods or sales commissions). M: I sure wish my costs were fixed. Everything goes up for me. My insurance, for example, looks like it's going up 25 percent over last year. C: Well, actually "fixed costs" is something of a misnomer. Sure, rents, property taxes, insurance, even the salary you pay yourself may fluctuate - but on a yearly basis and not in relation to sales. For the purpose of break-even analysis every cost that doesn't vary in relation to sales is called "fixed". Your rent, for instance, stays the same for a year whether you sell 250,000 or 2.50 worth of goods, though we know some rents are tied to volume and vary. The same is usually true of utilities, depreciation and similar expense items. M: I see the point. Variable costs, then, are basically my cost of sales? I have to buy more if I sell more. If I paid commissions, I'd be paying more for more sales, and that sort of thing. C: That's right. There can be other variable costs, but we're simplifying.In addition, you'll probably find costs that seem to be part variable,part fixed. M: You mean they're"semi-variable" or "semi-fixed?" C: Yes, they're costs that remain fixed up to a certain sales volume andthen jump as that volume is exceeded. For example, office costs, ordelivery expenses may fit in this category. M: How do I treat them? C: Use your good business judgment and split them between fixed and variable costs in what you consider a reasonable proportion. The important thing is to hold in mind for simple break-even analysis is to keep it simple. Over simplicity is, of course, a drawback of this method. But simple break-even analysis really helps you to see your way into a planning problem and to establish its perimeters. M: I like the idea of simplicity, but I don't think break-even soundssimple so far. C: I think you'll see how easy it is if we work through an example. Here,take a look at this hypothetical income or profit and loss statementfor the B-E Retail Store.